Experimental question combines race and Hispanic ethnicity. The Census Bureau has embarked on a years-long research project intended to improve the accuracy and reliability of its race and ethnicity data. A problem is that a growing percentage of Americans don’t select a race category provided on the form: As many as 6.2% of census respondents selected only “some other race” in the 2010 census, the vast majority of whom were Hispanic. Six percent may seem small, but for an agency trying to capture the entire U.S. population (nearly 309 million in 2010) every 10 years, that number results in millions of people unaccounted for. This pattern of response led to the bureau’s “most comprehensive effort in history to study race and ethnic categories,” according to Census officials Nicholas Jones and Roberto Ramirez. “Increasingly, Americans are saying they cannot find themselves” on census forms, Jones said. Many communities, including Hispanics, Arabs and people of mixed race, have said they’re unsure of how to identify themselves on census forms. Current Census form asks about race and Hispanic ethnicity separately. 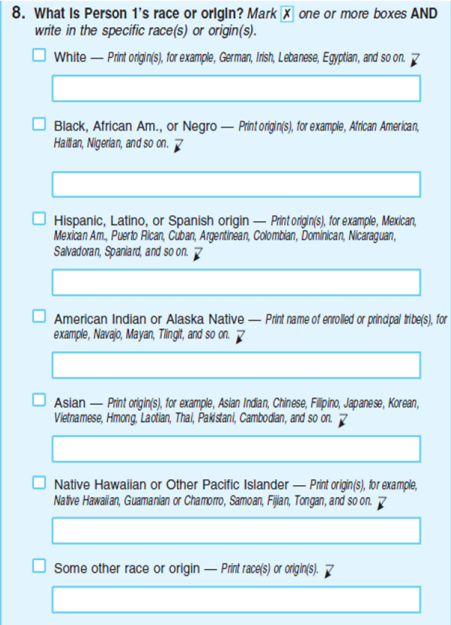 The 2010 Census form asked two questions about race and ethnicity. First, people were asked whether they are of Hispanic, Latino or Spanish origin. Then they were asked to choose one or more of 15 options that make up five race categories — white, black, American Indian/Alaska Native, Asian, or Native Hawaiian/Other Pacific Islander. A separate question about Hispanic origin has been asked of all households since 1980, and the census form specifically instructs respondents that Hispanic origins are not races. To address concerns about a rising share of “some other race” selections, a combined race and ethnicity question is under consideration for 2020, in which people would be offered all the race and Hispanic options in one place. They could check a box to identify as white, black, Hispanic/Latino/Spanish origin, American Indian/Alaska Native, Asian, Native Hawaiian/Other Pacific Islander or some other race or origin. They would be offered a line under each category to supply more detail about their origin, tribe or race. Examples of this include: German, African American, Mexican, Navajo, Asian Indian and Samoan. The Census Bureau’s goal is to reduce the number of people who select “some other race.” The category was added to the 1980 Census form to capture the small numbers of people who did not select one of the official race categories, and has grown to become the third-largest race category in the census, Jones said in a presentation this week to Pew Research Center. 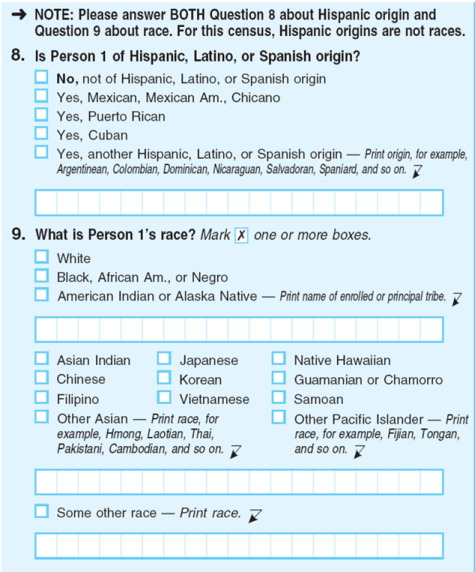 As the bureau has conducted experimental surveys and focus groups with a new approach to writing the race and Hispanic questions, some Latino groups have voiced concern that eliminating the separate question about Hispanic origin would result in a decrease in the number of Hispanics counted by the census. However, that did not happen in the experimental survey collection, according to the Census Bureau. Because census data is vital to determining everything from how congressional districts are drawn to $400 billion in federal aid programs and enforcement of civil rights laws, the prospect of having one race or ethnic group’s numbers change is fraught with political consequences. The bureau is continuing to research changes to the question wording. Agency officials intend to meet with Hispanic advocacy groups this spring and others interested in potential changes to the race-Hispanic questions to get feedback. It plans to test a combined race and ethnicity question on its Current Population Survey next year and on its American Community Survey in 2016. But a lot of work remains. Questionnaire changes would have to be approved by the Office of Management and Budget, which determines and defines the race and ethnicity categories. Any proposed topics must be submitted to Congress by 2017. Question wording is due to Congress the following year. Combining race and ethnicity into a single question did not result in a reduction of the proportion of the population identifying as Hispanic. Among those who identified as Hispanic, however, there was a decline in the number of people who wrote in a specific origin group. For Hispanics, the decrease was driven by people of Mexican descent, according to census officials. The selection of “some other race” declined to less than 1% of respondents when race and ethnicity were combined into one question, according to results cited by census officials. The category was chosen by as many as 7% when race and ethnicity were asked in the experimental and standard variations of the two-question form. The proportion of people who did not respond at all to race and ethnicity questions also declined in the experiment. About 1% percent did not answer the combined question. When the questions were separated, 3.5% to 5.7% did not respond to the race question and 4.1% to 5.4% did not respond to the Hispanic origin question. Despite concerns that the combined question would lead to less data about Afro-Latinos, the proportion of Hispanics who also reported as black was not statistically different in the separate-question or combined-question format, bureau officials said. The bureau will soon release more detail about this and other race reporting by Latinos.